I know, I know… the iconic white shirt has almost become a cliché. If you pay attention to those “Five Things Every Woman Must Have in Her Closet” articles, you’ll have read that a white shirt is a “must have” in every woman’s closet. Apparently. Well, I don’t know about that. I mean, if you don’t like white shirts, then don’t wear one. And clearly we shouldn’t pay attention to those silly, bossy, one-size-fits-all lists. But I will say this. I love a white shirt. Always have, since I was a kid. And a white shirt is always on my personal “must have” list. 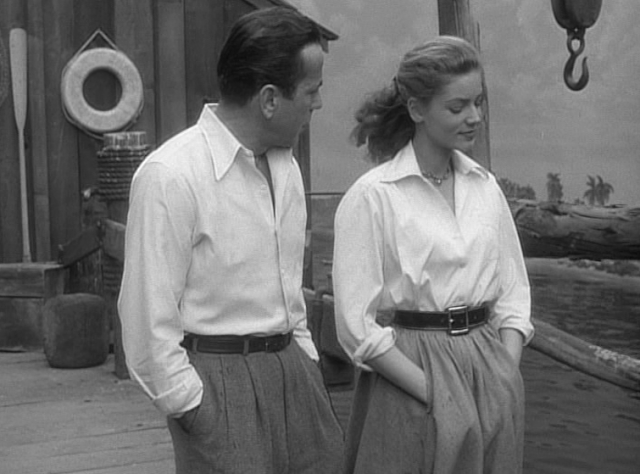 I mean just look at Lauren Bacall in her white shirt in the 1948 movie Key Largo. She looks cool and casual and elegant, doesn’t she? And Bogie doesn’t look half bad in his white shirt either. And nobody could rock a white shirt like Elizabeth Taylor in my opinion. 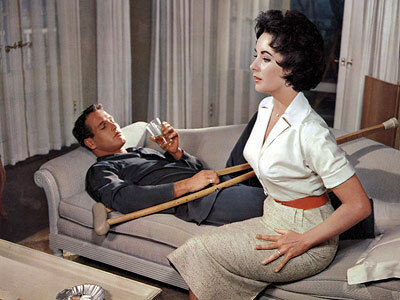 I love her in this shirt in a scene from the 1958 film Cat on a Hot Tin Roof, the notched collar, and the sleeves rolled up just so. Gosh, I love that movie. So, even if you don’t want to wear a white shirt yourself, there’s no denying that it is one item of apparel that never goes out of style. It’s pretty much timeless. Last year I eschewed the white shirt, ignored the fact that my old Theory white shirt was looking a bit tired, and bought a blue shirt instead. I branched out, so to speak. I still love my blue Equipment shirt. But this year there was just no getting around the fact that I still needed a white shirt. With my old white shirt now looking downright exhausted… I really, really needed one. So I’ve been looking for a white shirt for a couple of months. Every time I’m out and about, in whatever store, I do the rounds of the white shirts. Most of them are too short and tailored, or too long and baggy, too wrinkly, too thin and too cheaply made. Well, you get the idea. Then last week, I discovered this shirt at the newly opened Massiimo Dutti store here in Ottawa. I’ve admired Massimo Dutti ads in fashion magazines for a couple of years, the minimalist feel, the clean lines, the classic clothes. I was excited when I emerged from the parking garage at the Rideau Centre, and there in front of me was the new Massimo Dutti store. Took me about ten minutes to find the perfect shirt. It’s loose without being baggy, neither too short, nor too long. Collarless, which is nice for a change. Made of crisp cotton poplin. And with just enough seam detailing at the waist and on the sleeves to make it interesting. Perfect. And today I decided to try to take some shots of my timeless new white shirt. In a timeless location, you might say. At the historic mill here in Manotick. Perfect. Okay, to be honest, we have workers at our house demolishing our old deck in preparation for building a new one. And I just couldn’t see myself prancing around our sun room posing for pictures while they were right outside the patio doors. So I scouted an alternate site on my way home from my walk this morning. The mill and the dam on the river would be perfect. But then when I arrived back at the mill this afternoon, there were workers doing repairs on the dam, so I was relegated to the little park on the far side of the river. My shots are pretty bad, aren’t they? I’m a total newbie when it comes to “shooting on location.” Ha. But, at least in this shot, you can kind of see my new grey All Saints tote that I bought at the Nordstrom Anniversary Sale in July. And in this shot, at least you can see some of the details of the shirt. I’m also wearing my black Vince leggings and my Stuart Weitzman loafers. And in this one, bleached out as it is, at least you can see the split at the side of the shirt. And the fact that I’m wearing my new old bracelet which I bought at the Merrickville Antique Show in August. Here’s a better shot of the bracelet. The vendor said that it was made by Léa Stein, a French jewellry designer who worked in the mid twentieth century. My bracelet is probably from the sixties. And in this shot you can see that I’m a bit worried about all the bird action in this little park. Of course, as you know… me and birds… we don’t get on. Crap… is that one coming down here? While my very first “shoot on location” was not perfect, my new white shirt is. A versatile addition to my curated closet, it will go equally well with dressy pants or with jeans. Under a coat sweater, or a jean jacket, or a blazer. With or without a scarf. So I’ve been thinking, instead of reading all those lists written by other people who say what we “must have” in our closets. Maybe we should make our own list. Scratch that. We should definitely make our own list. Five things we “must have” in our closet. And if they wear out we “must replace” them. My list would include great blue jeans, black pants, a heavy turtleneck, a good blazer, and a white shirt. I have other pieces, of course, which I love equally as much. But these pieces are always there. They always get replaced when they wear out. Decade after decade. They’re timeless, at least in my closet. Your list might be completely different. Now, do tell, friends, what five things must you have in your closet? And does that list include a white shirt? 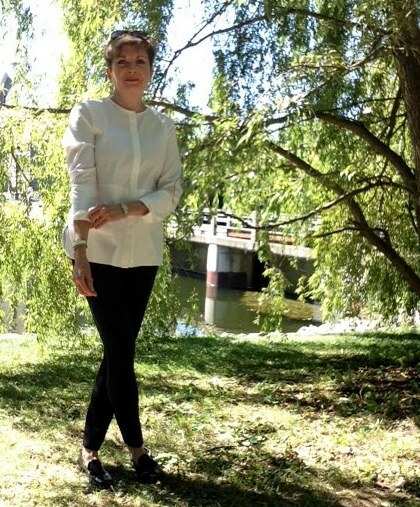 I love white shirts since my primary school-it is an eternal love! I think it goes back to my childhood for me too. A crisp white shirt (or blouse) with a new skirt for school. Back when girls weren't allowed to wear pants or trousers to school. Definitely black ankle boots and a camel coat, for me too. Although I don't always own a camel coat… but I'm always longing for one. Maybe this will be the year I replace the one I eventually had to throw out after wearing it for nine years! Great post , I'd like to see more of the area you live in . No Massimo Dutti near here but have shopped at a London one & recently Turin ( that sounds good doesn't it ) . Very stylish , not expensive & the things I've bought have been good quality . I have a love / hate relationship with white shirts . Love them but hate caring for them , so they tend to sit in the wardrobe too much . Yours looks easier to iron than most – no twiddly bits , I like it . Also love the bracelet but would call it a bangle as it is stiff , interesting the differences in our common language . My list is the same as yours but would add a loose ribbed jumper , navy wool in winter & cream cotton in summer . Thanks, Wendy. I've been thinking about taking more blog photos out and about. It's just that for fashion shots I have to be able to prop the camera/i-pad on something, and then wait until there are definitely NO people around. Yesterday I was glad to have my travel mug of tea as camouflage. Sipping my tea was the equivalent of nonchalantly kicking the dust and whistling until the interrupters had moved out of sight. I had a dog walker stumble into a shot, two boys carrying a take-out pizza, and of course the workers on the dam. That shirt is a stunner! Love it! 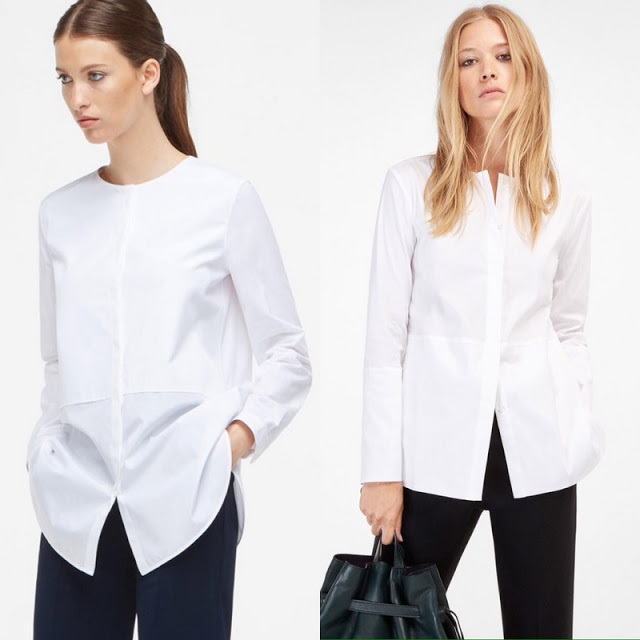 I found a perfect white shirt by Lafayette 148 at the Nordstrom Ann Sale last year. A bit fitted, zipper front and so very flattering. If I had a Massimo Dutti store near me, I would definitely check out the one you bought! I don't know that brand, but I will looking into it. I think you did very well for a first attempt at location shooting. I'd have been far too shy on my own, I have to say. I'm curious: did you try editing the photo lighting up or down on your camera or computer? I "cheat" that way regularly myself. Hmmmm, five pieces. Let's see: jeans, black (and navy) v-neck pullover, lightweight cashmere, preferably, black ankle boots, camel cashmere scarf. But five is NOT enough! My leather moto jacket and my navy peacoat. Black sneakers. Silk scarf in print featuring cream, navy, and red or muted orange… And much as I have regularly tried for the white shirt, I've finally admitted that they just don't suit me. . . I tried to darken and lighten and play with the shots, but that is the best I could get. I think part of the problem is that the shirt is so blindingly white… I even have trouble taking shots of a white shirt indoors. The light has to be just right. And of course, being sooo worried that someone would see me. Looks the height of vanity taking photos of yourself in a park! So I was rushing. I'm thinking of trying to do some photos at my Mum's when I'm in New Brunswick next week. Lots of scope for background on the old farm. White shirt- Eddie Bauer wrinkle free. It's classic, easy to keep clean and has worn forever. Slim jeans, navy v-neck sweater, yellow denim jacket and tan trousers. Living in the southwestern US requires a lightweight wardrobe. Those five pieces are my fall/winter go-to's. I guess your fall/winter wardrobe needs would be verrry different from mine. No heavy down coats needed! 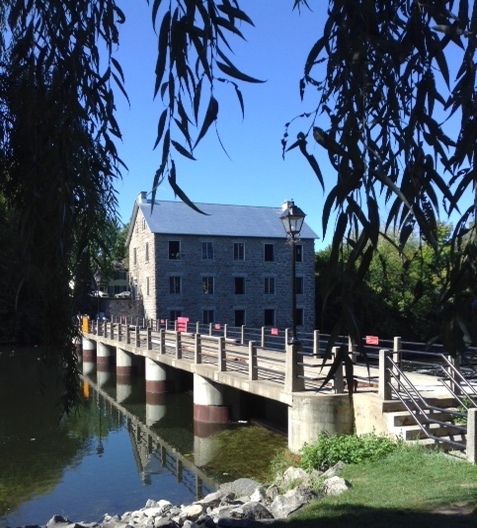 What a treat to see the Mill in Manotick. It has been a few years. As for the essentials…you were spot on. My leather jacket is one of my favourite things as well as boots. It is interesting how we all seem to have the same aesthetic no matter where we live. Is it generational? Boots for sure. I think it must be generational… I was a teenager in boots, jeans, and tees. Don't you just love Massimo Dutti? Nothing that will set the world on fire, but good basics, reasonably priced. That's a good looking shirt! Shooting on location is a bear if you don't have a photographer. You did very well first time out! I really like Massimo Duttis clothes, but I'm new to actually trying them on in person. So we'll see. I'm determined to do the photography myself. I'm really enjoying learning how to do all of these things. But it most definitely is a work in progress. What crazy timing….I just decided to "retire" my favorite white shirt from my work and going out rotation and move it to my weekend-over-jeans with sneakers or moccasin rotation and so now I'm on a mission for another perfect white shirt (I actually think the style of my shirt is Perfect Shirt by Ann Taylor). No rush, though, I enjoy the hunt! But I don't enjoy wearing a shirt that feels just a little too dingy in an outfit that begs for a pristine, crisp one. I would guess that the shelf life of a white shirt in my wardrobe is about 3-4 years, worn a couple of times per month. Other staples: black patent leather loafers, nice black knee-high flat boots, a lined (removable) black or khaki trench, great scarves, the perfect black or gray cardigan. Oh and T's in white, black and gray. But don't get me started on the perfect T…..Gap stopped making their Favorite t's this year and I haven't found a replacement I like as well. I enjoy the hunt, too, Adele. And you're right…white shirts need to be replaced every three or four years. I hear you about Gap tees which used to be a staple for me. Then they started messing with the necklines, and I'm not so happy anymore. So which shirt did you buy? The "cinched waist detail" poplin for $94.50 or the large poplin for $110.00? Your fans need to know! I've had my eye on the less fitted one ($110.00) Did you try them both? I love your blog Susan, thanks so much for your many great book recommendations. I bought the "cinched waist detail" for $94.50. I made a very quick troll through the store but only tried one shirt on and bought it. The term "cinched waist" is a bit misleading… since there is no cinching that I can see. The shirt fits more like a tunic, not fitted at the waist, quite straight up and down. Glad you have enjoyed the book recommendations! Back to clothes! Love the shirt! In fact, I think I'll try to order one. I like the neckline as for some reason I don't really suit the classic white shirt style that's usually recommended in article on the importance of a white shirt in our wardrobes! Now that would be a divine combination… Atwood in Oxford. I really like the collarless shirt because I never know how to add a scarf to a button down shirt. Over, under, half and half??? ps think I'd really need some scarves though!!! Hard to choose five, isn't it? But I looked at five things that I've had in my closet in one form or another for years. Doesn't mean there aren't other things that are "essential." Like scarves. I'm at my Mum's this weekend and next week. Tea and talk…on repeat. You found a great white shirt! And I love that you ventured out and took the photos! 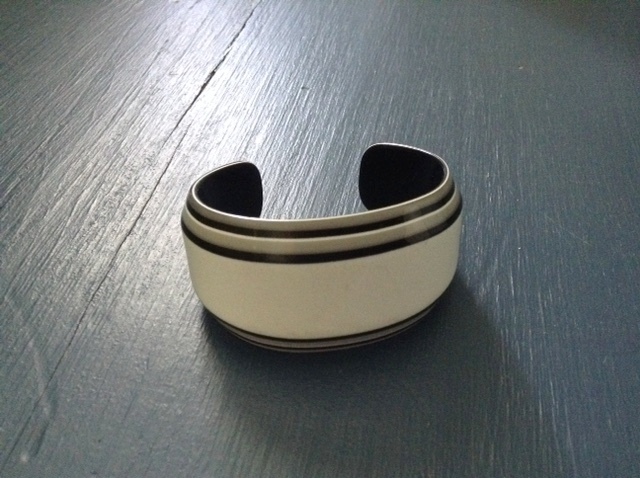 Great cuff, too! A white shirt is on my list of items to look for, but I'm not sure it makes my list of 5 items. Let's see: leggings, tunic, skinny jeans, structured jacket, scarf. Thanks, Andrea. Hoping to venture out some more… weather permitting. I'm waiting for my flight after a glorious weekend in New York. Ironically I bought a new white shirt – v-neck long with side slits at Zara. Very soft Pima cotton feel. It was my first time in Zara – very trendy for younger gals but I found a few pieces that brought a fresh look for fall. Has anyone tried Zara. 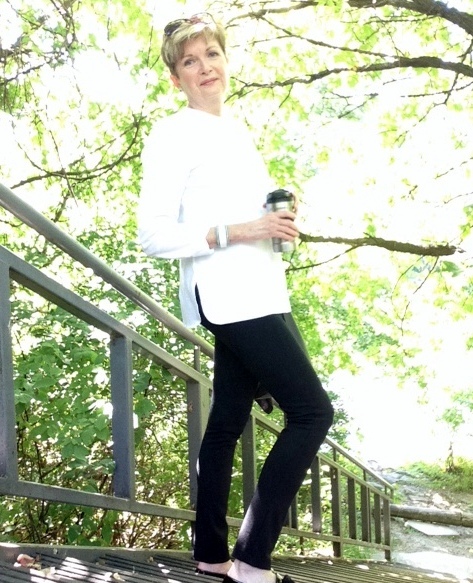 My staples: dark slim jeans, black Eileen Fisher crepe pants, black ankle pants, a v-neck knit top because I have a short neck, and a statement necklace. I also like to add a hip or long length vest for a touch of drama, plus it hides midriff issues! Love your blog. I'm hoping to have my own "glorious" stay in New York next month. I've shopped at Zara a few times, but mostly things don't fit me. Although I did buy my down coat there three years ago and still love it. Thanks, Patti. I was surprised that Massimo Dutti was so well priced, I'll definitely make it part of my shopping rotation. Better to have the perfect white shirt than a perfect location without the white shirt! Really like the cut of yours – I can totally see why you like it. I only have one white shirt and it's a embroidery anglaise one which I love. I'm dreading it wearing out as I think it's irreplaceable! As to my five things – only 5? Um… dark wash indigo jeans, good leather jacket, a well cut tailored blazer, ankle boots and a great day dress – you know the kind that you can dress up or down that can go from desk to drinks with just a change of jewellery or shoes. A great dress is always on my list to find. Just that I so rarely find one. Although I haven't looked for a fall/winter dress for years. Hmmm.Maybe Massimo Dutti has dresses. Lovely white shirt, it suits you well and will be easy to dress up or down. Massimo Dutti is one of my favourite shops, generally nice quality wearable things with enough detail to add interest and a reasonable price. I wish they would open here in Australia, but they don't even ship here so I have to get my fix when we are in Europe. Thanks, Lilibet. I was so pleased to find the Massimo Dutti store here in Ottawa. And surprised! I'm surprised that they don't ship to the US, Beth. Must be one of the few times when we can get a brand here in Canada and you can't. Loved Belgravia, by the way. More on that at a later date…no doubt. White shirt (lots, I love them). Levis. Black dress of some sort. Black suede slingbacks (I need a pair – stat!) Boots, preferably black. I am happy when I wear any of those. I cannot abide fuss of any sort when it comes to clothes. Ah well. Black boots…ankle boots with a low heel are a must for me. I also don't like having to fuss with my clothes… If that's what you meant by fuss. So many times I'm scarf challenged because they move and I have to fiddle with them. Gad! Hate that.